Cumbria farm holidays means an idyllic cottage in the country! Here you will find a wealth of country cottages and farm accommodation to choose from in our listings of self-contained farmhouses and farm Bed and Breakfasts. All offer quality accommodation at reasonable rates. If you are looking for cheap accommodation in a rural setting within the heart of the English countryside then look no further. You are sure to find something here that suits your needs. This is one of the most beautiful places of all England that has inspired people like William Wordsworth and fellow poets to wax lyrically about nature's bounty. 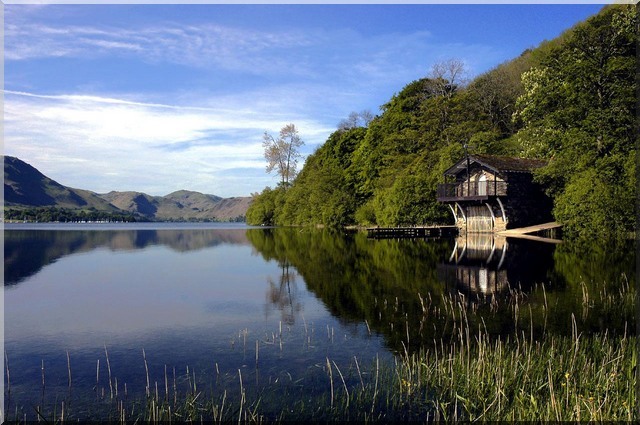 Cumbria is England's second largest county and is well known for its many lakes and the area is commonly known as the Lake District.Within the Lake District National Park is England's highest mountain Scafell Pike, at 978 meters. For those of you who are interested in history part of Hadrian's Wall can be found in the northernmost part of this county. Hadrian's Wall was made a UNESCO World Heritage Site in 1987 and is not to be missed during your Cumbria farm holidays. Each year for one weekend in July, Langwathby village displays fierce competition as villagers compete to create the best scarecrow. The first such competition was held in 2004 to raise much needed funds to repair the Village Hall. It was so successful, that it was decided that the scarecrow festival would become an annual event. Another rural tradition is held in Egremont in Cumbria as part of the annual Egremont Crab-Apple Fair, and that is the World Gurning Contest. Basically this is a competition for those sporting the ugliest 'mug' (face). Contestants traditionally frame their faces through a horse collar known as 'gurnin through the baffin' as they contort their faces into grotesque shapes. Pipe smoking, Cumberland wrestling, morris dancing and a ferret show are among some of the attractions at the fair, attracting about 10,000 visitors. This is a county that has something to suit everybody's taste. When you come for Cumbria farm holidays you will find an array of attractions: great outdoor pursuits including waters sports, climbing, horse riding, walking, heritage sites, attractions, gardens and stunning coastal scenery. When you next visit Cumbria why don't you choose one of our listed English country cottages? Book your country and farm accommodation through our listings of Cumbria cottages or farm Bed and Breakfast for your next country cottage holiday. If you have a farm in Cumbria that you would like to showcase visit our Farm Forum. You can upload a picture and brag a little. We don't mind! Share a farming story, tell us about your best or worst farm holiday and lots more. There are other individual farming discussion boards to contribute to through this forum, as well as a Craft & Recipes Forum where you can share your favourite recipes and also get some crafting ideas for various arts & crafts. Are you looking for more information for your farm holiday to Cumbria? The following web site is a wealth of information for those who wish to explore the Lake District. The Lake District Discovered. Their aim is to provide you with all the information needed to have a great break in the English lake district. For Camping, Walking, Pamper/Spa Breaks, Accommodation, Mountain Biking, Extreme Sports ... visit Lake District Discovered.